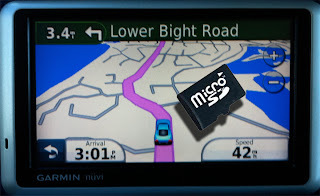 Did you purchase a GPS map digital download from GPSTravelMaps.com, but you would prefer to upgrade to a map on a SD memory card? For only $19.95 + shipping you can upgrade your digital download to a SD memory card. The $19.95 covers the cost of the SD memory card. The SD memory card will be sent directly to your front door. Once received, you simply slide the SD card into your GPS device, and turn it on. The map is loaded and ready to use! Previous purchase of a downloadable GPS map is required to take advantage of this offer.